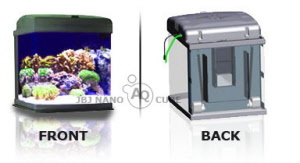 JBJ's newest release is an aquarium powered by 3 Watt LEDs. 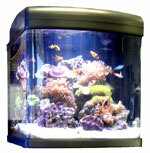 This unit features the brightest lighting we currently offer and will not require an aquarium chiller. 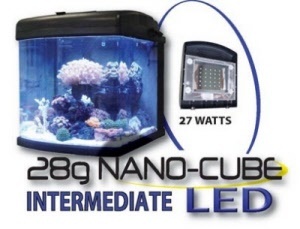 Be the first to own this awesome the 28 LED Nano Cube Aquarium. More pictures of this and a movie for you later this week. 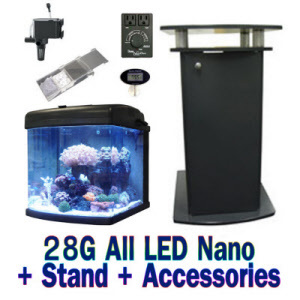 In addition to the aquarium LEDs, you can add on the JBJ Nano-Glo 4 LED refugium light. The Nano Glo 4 is some intense LED lighting. 4 high intensity LEDs and attaches to the central sump area via magnets. This makes growing Chaetomorpha macro algae a breeze and can be hidden in the back of the tank.